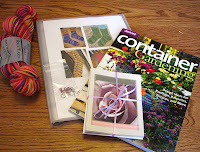 I just got a note from my partner in the Longing for Spring swap -- she received my package. So now I can post about it! The idea behind the swap was to send your partner some spring-y things... and of course some knitting things. My partner doesn't have a garden -- she lives in an apartment with a shady balcony. So I sent a book on container gardening, and some tuberous begonias directly from a nursery. Her favorite flower is the Sterling Rose. Obviously not something she could grow on her balcony. So I made some notecards with photos of Sterling Roses on them. She loves knitting socks and has a wonderful, impressive stash of sock yarn (beautifully cataloged on her Ravelry site). It was easy to look at what she already had and pick some fun spring-y sock yarn from an Etsy seller. I made some stitch markers to match. And the last item is a binder filled with sock patterns I printed out from her Ravelry queue. Better late than never I always say - since I'm a master procrastinator. You should FINALLY be receiving your Scavenger Hunt goodies from me tomorrow, Friday 3/20.